It is the season for birds! Which makes it my Mamas least favourite time of the year. She is utterly terrified of birds. Which also means she is not such a fan of coming over to the farm, you know, given our flock of lovely feathery ladies. Especially since those ladies are so tame and like to come close for a visit. But my kids and I have no such fear of our feathery friends. In fact, we are at the complete other end of the spectrum – we adore them. 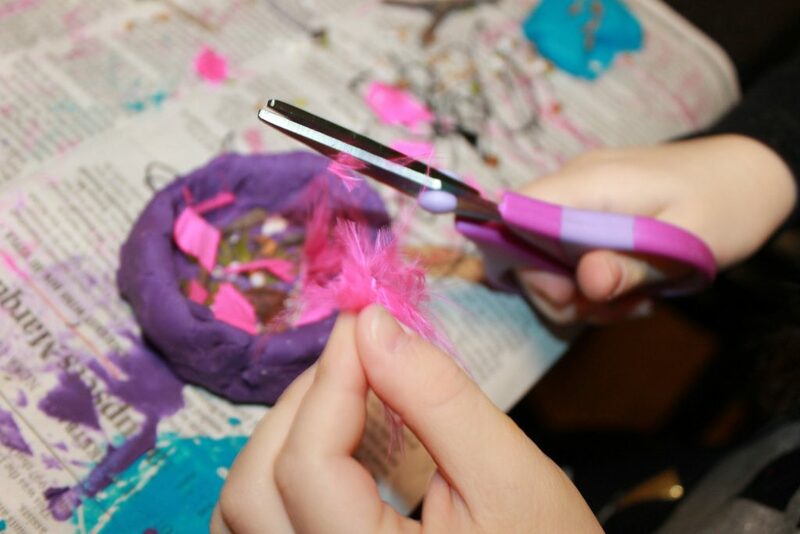 Lots of our crafting these days is taking place with feathers and this week we are going to make our air dry clay bird nests once again too. Kim of The Pinterested Parent made some playdough bird’s nests with her daughter and was kind enough to share that post with us right here. It seems she does not have a bird phobia either. One of the great joys in my life is watching my little one create. There is this beautiful energy that takes over when crafting. 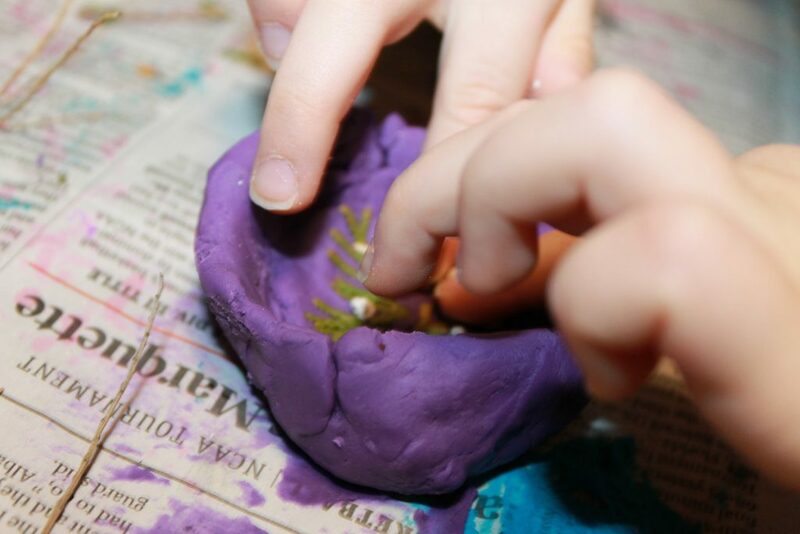 One of our favorite activities has always been to work with play dough or clay and items in nature. My little one just adores it. Some beautiful and imaginative creations have occurred from combining the two. We have enjoyed making islands, winter wonderlands and rock mosaics. 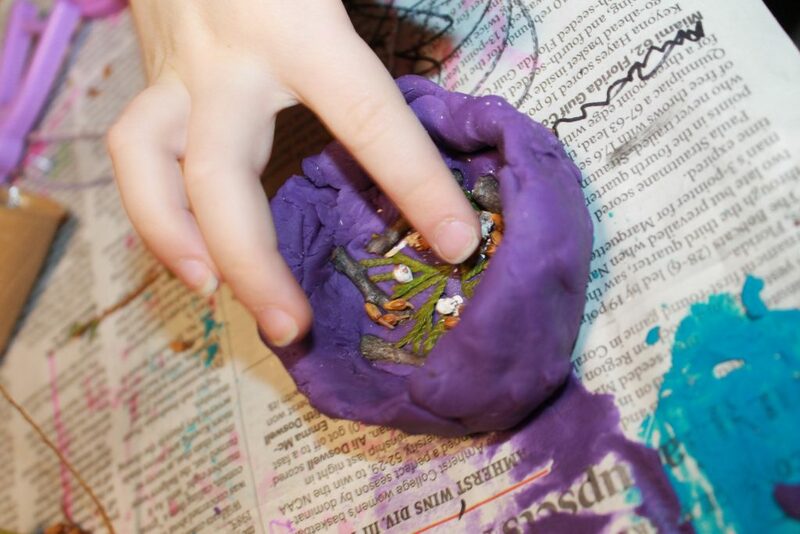 These play dough and nature bird’s nests were another huge hit. It all began after we discovered that a new bird’s nest was built under our front window. I didn’t want to disturb the nest by getting too close, so we stepped back and observed it. My five year old was fascinated by the bird’s nest and how it was made. She was especially interested that it had strands of colored blue plastic in it. She wanted to know why it was there and why the birds made their nest with it. I reminded her about the Dr. Seuss book ‘Best Nest’ and how the birds used all sorts of materials, such as hay, string and hair to build their nests. She remembered and went on to point out what else she thought this nest was made of. After looking at it for a bit, it was settled. 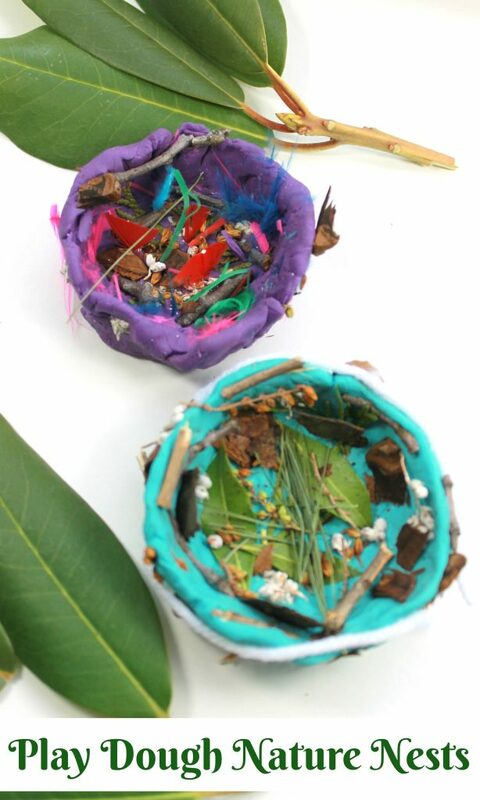 We would have to make some little bird’s nests of our own, so that is just what we did. 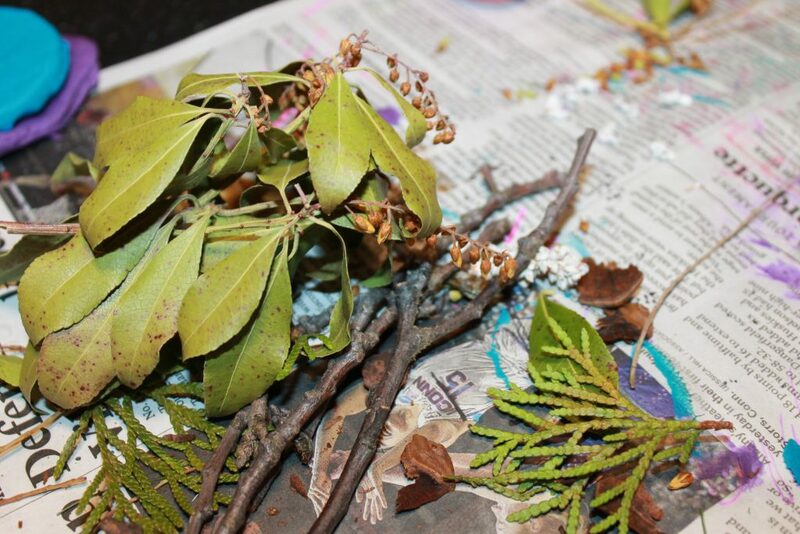 Like the birds, we scavenged the yard and looked for materials to help build our nests. We filled up a box with the supplies that we collected, which consisted of sticks, leaves, berries, pine cone pieces and grass. 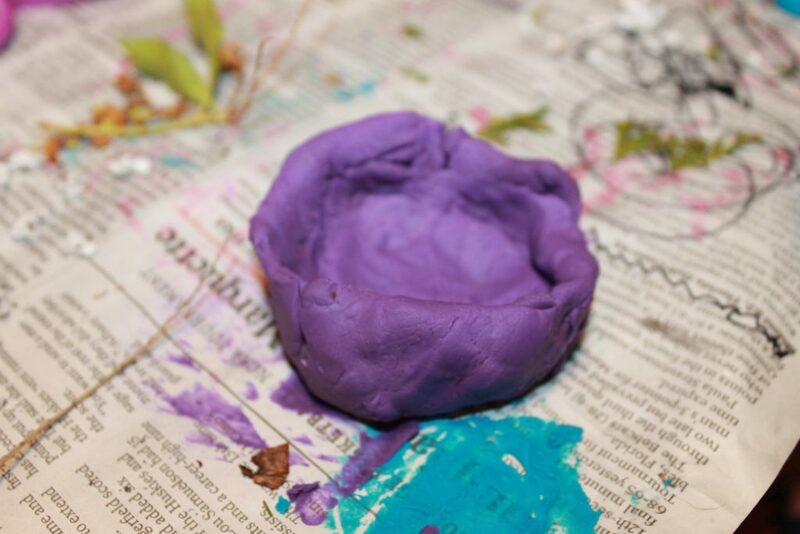 We each rolled out a ball of play dough and formed a nest shape. We did this by pressing into the middle of the ball with our thumbs and pushing and pinching the dough outwards. 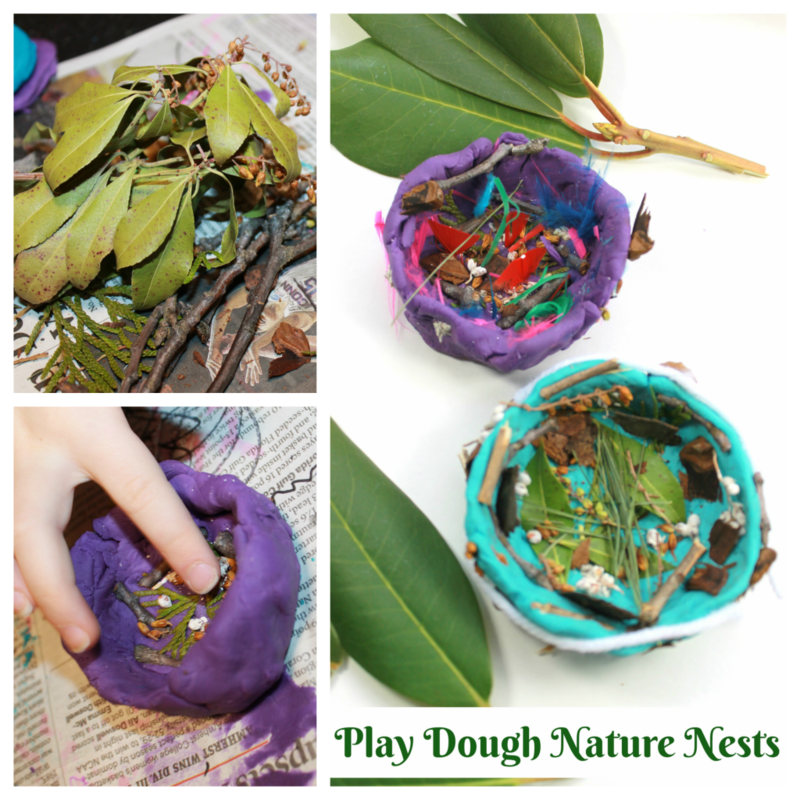 We broke, cut and pulled apart our assorted nature items and pressed them into our play dough nests. My daughter explained that the birds would want to be comfortable, so the bottom of the nest needed a lot of stuff to make it cozy. She then reminded me that we needed string like the nest under our window. We did not have any quite like that, so we cut up pieces of yarn instead. She spotted a bag of feathers and we grabbed a couple of those, as well. 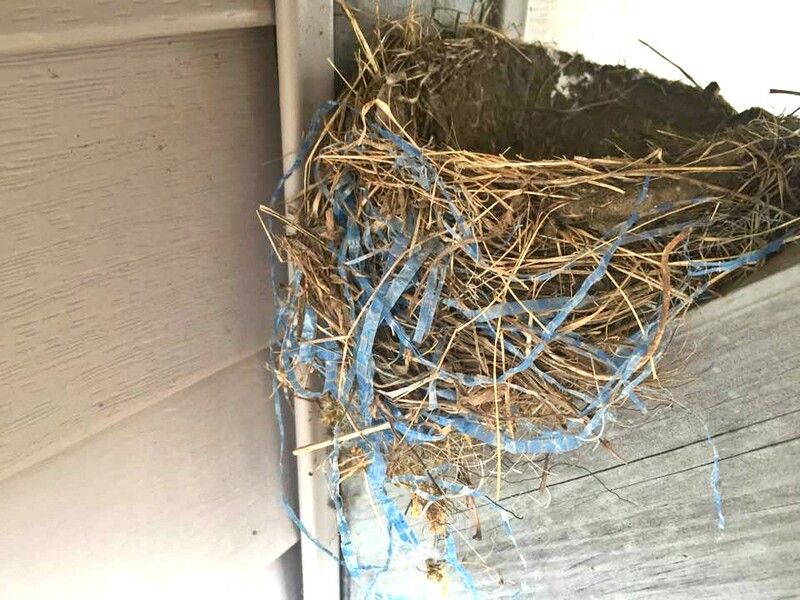 The feathers were going to make the nests extra cozy. They also added a nice touch and a little extra color. When we were done, we set the nests aside to harden. This is such a simple and beautiful way to help little ones connect with nature. Children are so naturally creative and curious about their natural world. Combining these two passions is sure to be a hit. I love seeing what you are up to with your little ones – if you have tried one of the activities I have shared with you over the years I would love to see. Please send me your pictures! Thank you so much for reading friends. I hope you are having a fabulous week! And thank you so much to Kim for sharing this post with me. Kim blogs over at The Pinterested Parent. You can follow her on Pinterest, Facebook, Instagram, or Twitter – whatever suits your fancy!